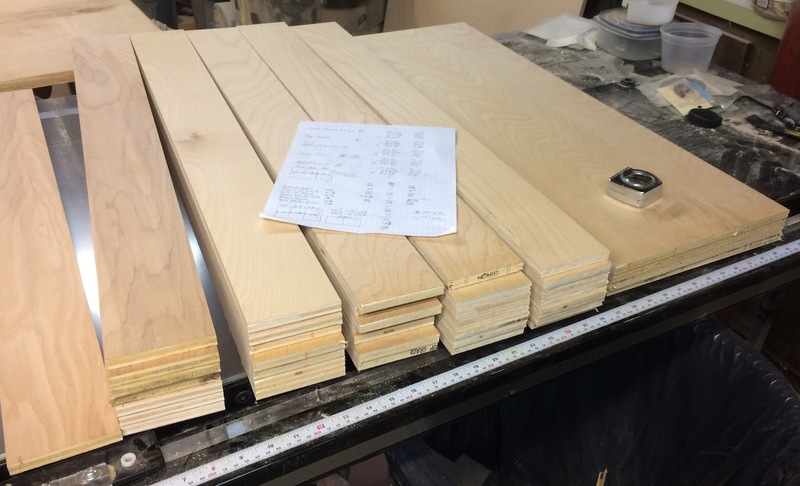 Norm used Baltic Birch plywood for his drawers. It's a very nice plywood. Generally very flat and with a lot of void free layers it is very strong. I don't have any Baltic Birch plywood and I'm not building the hutch so his cutting diagram isn't going to work for me anyway. What I do have is some cabinet grade Birch plywood. It's void free - hopefully - but it has less than half the number of layers as the Baltic Birch. No matter, it's what I have and it should be good enough. At least I hope so. Regardless I need to come up with my own cutting diagram for 4x8 sheets of plywood. The first step is to come up with my cut list. What happened to the medium drawer? I decided that it would just be a lot easier to make another small drawer and have one less setup. If down the road I decide I want to change things up I can always change it then. What I should have done is cut my drawer bottoms out of each piece first, then turned the remainder into the rest of the drawer pieces. Well, that's all water under the bridge at this point and I do still have enough plywood for four drawer bottoms and I have a big pile of drawer sides, fronts and backs. I'll just stop by my friendly local lumber store and pick up a sheet of 1/2" Baltic Birch after work some day this week. Today I set up my Leigh dovetail jig. I did use it once before. Well to be accurate, I helped a friend use it for his replica civil war campaign desk. It had to have been set up for that but that was a number of years ago and I can hope I'm better at setting up tools now than I was then. Better safe than sorry. Since the tool was already assembled all I needed to do was set up the side stops. Next step was cutting some test half-blind dovetails. I setup my mid-sized router with an 18 degree 3/8" dovetail bit from Whiteside Machine. 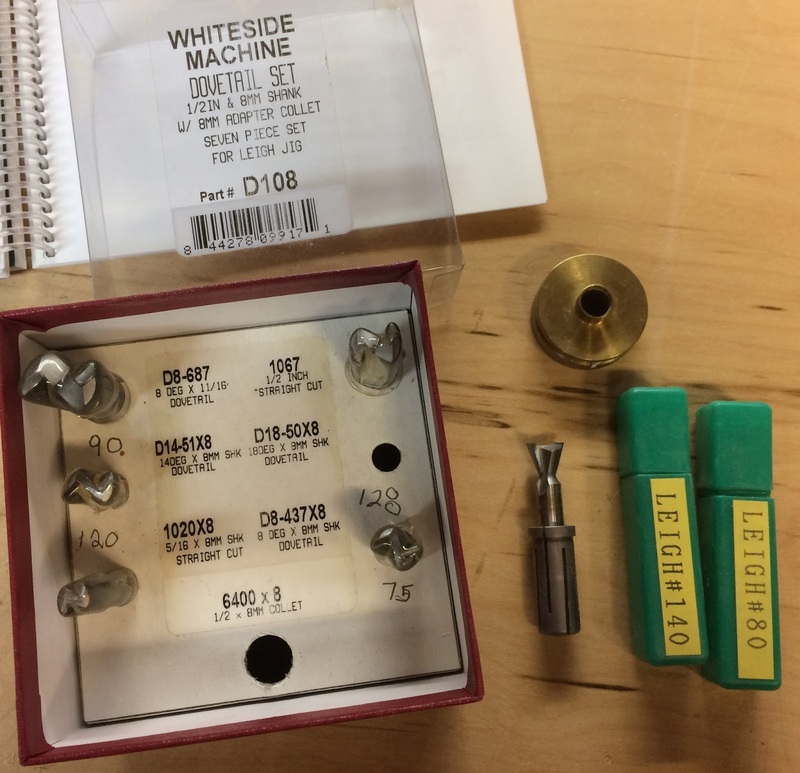 The set that I bought has a number of bits that are equivalent to Leigh bits unfortunately they use a different labeling scheme. Easy enough to solve. I just wrote the Leigh equivalents next to the bits. My first attempt was way too tight so I raised the bit a small hair and the second pass worked perfectly. When I got to this point it was near the end of the afternoon so instead of starting the work of trimming the fronts and sides to length I decided to wait and do it when I wasn't already tired. If I get an evening in the shop this week I'll trim the fronts and sides to length so next weekend I can get right into cutting dovetails and building drawers. 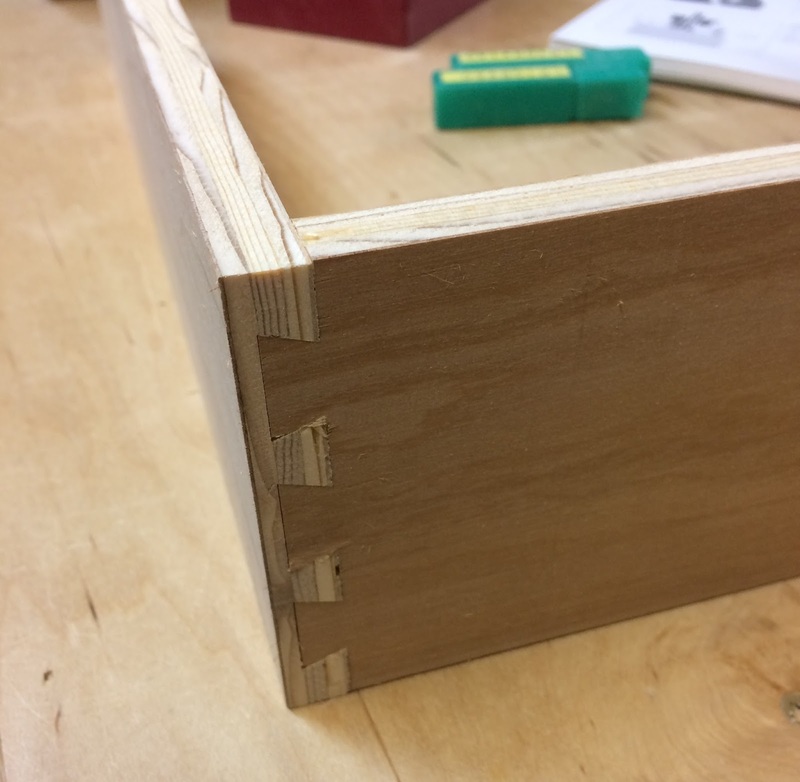 This is going to be a lot more work than just cutting drawer lock joints but as a side benefit it should get me some good practice using my Leigh jig.